Definition at line 42 of file llfloatermap.h. 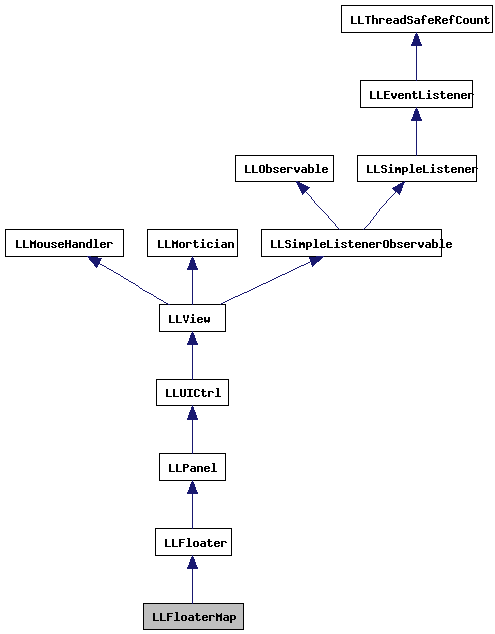 Definition at line 118 of file llfloatermap.cpp. References LLView::addChildAtEnd(), gColors, LLControlGroup::getColor(), LLRectBase< Type >::getHeight(), LLRectBase< Type >::getWidth(), LEFT, LLPANEL_BORDER_WIDTH, LLFloater::mDragHandle, mMap, LLView::mRect, LLView::removeChild(), S32, LLView::setFollowsAll(), LLFloater::setIsChrome(), TOP, TRUE, and y. Definition at line 154 of file llfloatermap.cpp. Definition at line 179 of file llfloatermap.cpp. Definition at line 186 of file llfloatermap.cpp. References LLAgent::cameraMouselook(), LLFloater::draw(), LLView::drawChild(), FALSE, gAgent, LLView::getVisible(), LLFloater::mDragHandle, mMap, LLView::setMouseOpaque(), and TRUE. Definition at line 169 of file llfloatermap.cpp. References FALSE, gSavedSettings, LLControlGroup::setBOOL(), and LLFloater::setVisible(). Definition at line 160 of file llfloatermap.cpp. References gSavedSettings, LLControlGroup::setBOOL(), and LLFloater::setVisible(). Referenced by LLViewerWindow::initWorldUI(), and reset_login(). Definition at line 209 of file llfloatermap.cpp. References LLFloater::close(), LLView::getVisible(), gFloaterMap, and LLFloater::open(). Referenced by handle_mini_map(), and LLShowFloater::handleEvent(). Definition at line 57 of file llfloatermap.h. Referenced by draw(), and LLFloaterMap().